San Antonio is filled with live music venues around the city. Students enjoy listening to bands in places such as The White Rabbit, Sam’s Burger Joint and Backstage Live. “I like seeing Eddie Gonzalez live at the Gran Plaza. He’s a great Tex-Mex artist who puts on a great show,” said Eugene Vargas, a freshman Music major. San Antonio is the heart of Tex-Mex music, which combines Mexican and American culture into one. Artists like Emilio Navaira, Jay Perez, Elida Reyna and La Mafia have opened up the doors for many upcoming Tejano singers. 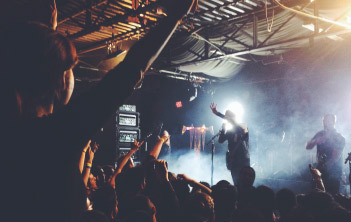 San Antonio and its surrounding cities have popular live music venues that cater to different types of music. “I actually went to go see Ab Soul at the White Rabbit and Wiz Khalifa in Austin. There is not a lot that San Antonio offers for the rap community. If you are into rap music, the main place to go is in Houston. If you’re into rock music, you mainly go to Austin,” said Omar Pete Molina, a freshman Biology major. The White Rabbit hosts both rock and rap genres, like Craig Owens from rock band Chiodos and Academy Award-winning rap group Three 6 Mafia. Sam’s Burger Joint welcomes local music along with well-known artists ranging from rock to jazz, folk and pop music. Backstage Live and The White Rabbit also stage rock, metal and rap artists live at their venues. San Antonio natives Austin Mahone and Video Music Award-winning Ally Brooke Hernandez, member of girl group Fifth Harmony, started playing shows in local venues and have succeeded in creating a worldwide following. “If the local bands are good and I enjoy their music, I will go to support them at their shows,” said Kayla Crodin, an English major. Lonely Horse will perform at Sam’s Burger Joint on Friday, Dec. 5. On Saturday, Dec. 6, Jacob Whitesides featuring Dylan Holland will take the stage at Sam’s Burger Joint. Caspa & The Others will perform on Saturday, Dec. 6, at Backstage Live. For the full list of music events in San Antonio, visit thrillcall.com or sanantonio.eventful.com. “San Antonio is an important music center, not just for Tejano music, but in general for the United States. San Antonio is a breeding ground for culturally creative people,” said Tejeda.